Abdul Alhazred is noted as the author of the original Al azif, the fabled texts that detail arcane magic, ideas and truthes about a collection of malevolent, yet often indifferent extra terrestrial entities that could be considered gods, due to their age – some are thought to have existed in previous incarnations of our universe, or indeed, responsible for the universe – yet not through some benevolent creation mythos, more likely an accident. This book is one of many books, written by wanderers, prophets, thinkers and madmen. Alhazred penned the Al azif in the final years of his life, around 730 AD, whilst living in Damascus. He spent many months alone in the deserts of Arabia, communing with what he called “evil sand spirits”. His death is often disputed, some say he was kidnapped and taken to a nameless city, the vestiges of a race whose knowledge of the unknown surpassed Al Hazred. Some say he was killed for stealing bread, or indeed eaten alive by some vile creature. His book was copied countless times, and was considered one of a number of books which together formed a far larger text – often known as the “desert book” or later “Sand bibles”. The texts were distributed and copied by many followers of the old gods, factions of which fought and murdered in the name of whatever tentacular abomination they considered the most depraved and unholy of the deific family. Different Gods were honoured in different habitats, the decrepit seaside villages often the mighty Dagon, Hydra and Cthulhu, the forests Shub Niggurath or Tsathaggua. Of the sands, Hastur, and above all, he who shall not be named (although often was,) Azathoth, the Godhead. Predating Al Azif is the Nardor Halefa, a psalm book with illustrations and text taken from books which may have influenced Alhazred. This volume accounts a number of ideologies pertaining to the gate and the key, Yog Sothoth, the all in one, and one in all. Yog Sothoth is apparently capable of knowing all, and the book explains the genealogy of the deific family, and thus the order of prayer and the eventual key to enlightenment. The book is written in a dead alphabet not unlike Essot. 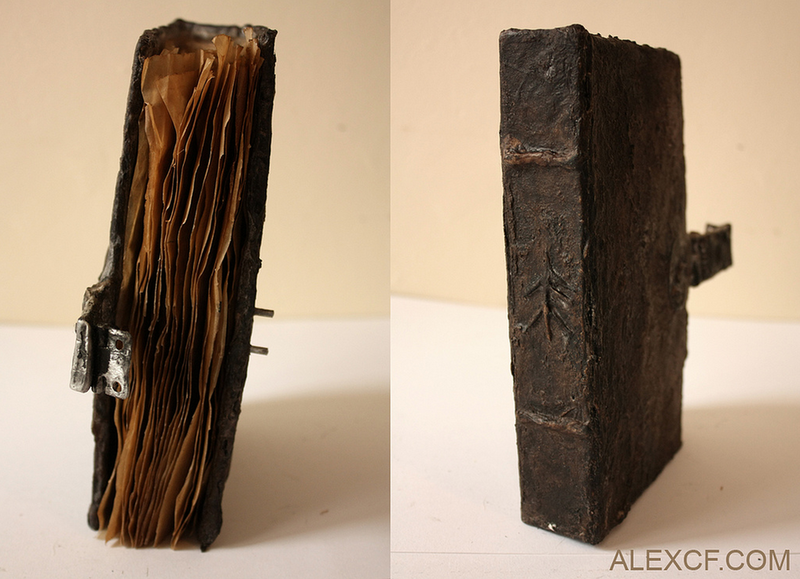 The book is crude, bound in hide, possibly cow or indeed human, and sports a clasp engraved with an “elder sign” and various unknown hieroglyphs. It has various page markers added by, and written by Merrylin himself. The book came into the possession of Merrylin in the late 1890′s, after he himself traveled to the Arabian Peninsula in search of a forgotten settlement, known as the “Nameless City” or “city of Pillars”. It was said that Alhazred himself discovered the city and that it played a part in the penning of his book. Merrylin sought an authentic copy of this book, or indeed proof that the man had been there. It is said that the ruins did speak of some ancient, inhuman presence, the very architecture unsuitable for a humanoid frame, with walls far too low. Yet in his diaries he does mention what he found. Along with a number of other books and items which sparked a great interest in seeking out information regarding the fabled “Cthulhu Mythos,” this would eventually culminate in one of the last collections added to his personal horde. Around 1935, the explorer William Dyer would donate a haul of specimens brought back from an ill fated expedition to the Antarctic. 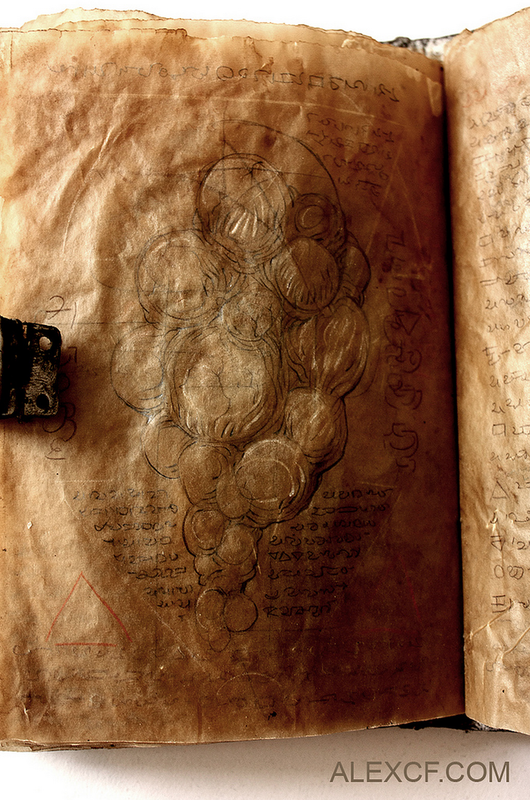 Merrylin would construct an elaborate interconnection between his copies of the Pnakotic Manuscripts,Necrotic texts and writings of the Elder things into one of the most comprehensive histories of the Old ones.